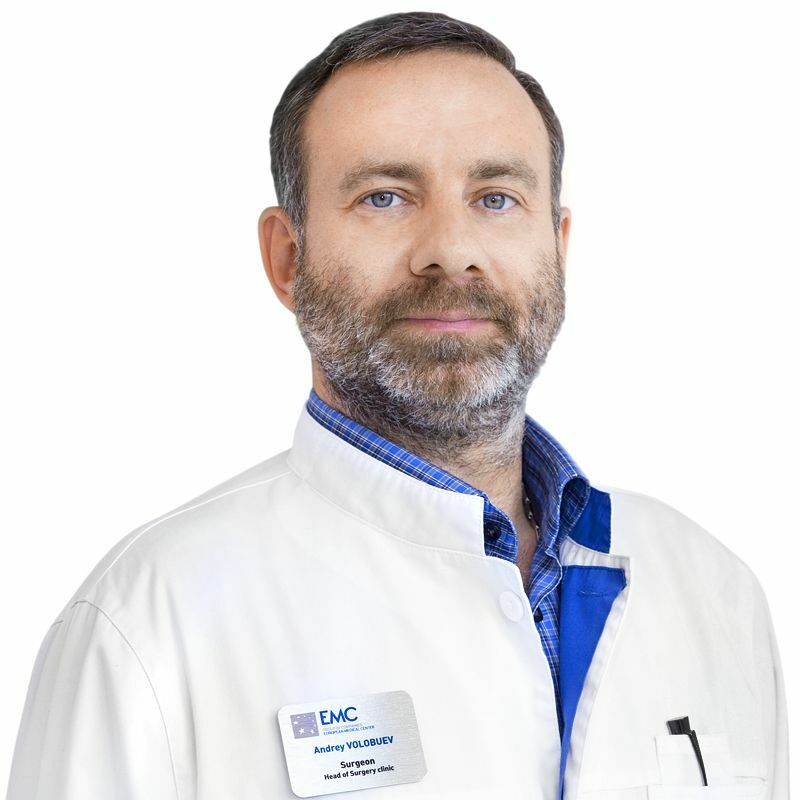 VOLOBUEV Andrey, Oncology Doctor EMC. Make an appointment, ask a question. Head of EMC Surgery Clinic, M.D., Ph.D. He graduated in 2000 from the I.M. Sechenov Moscow Medical Academy and in the same year entered clinical residency in the surgical department of tumor diagnosis at the N.N. Blokhin Russian Oncological Research Center. From 2002 to 2005, he attended graduate school and defended his thesis on the topic: "Thoracoscopy for the diagnosis of space-occupying lesions of the lung and pleura." In 2010, he completed an internship on the opportunities of laparoscopy for surgical intervention in the liver in Elancourt, France. In 2014, he interned on laparoscopy in tumor lesions of various sections of the colon in Portsmouth, England. Since 2005, he has worked as a researcher in the surgical department of tumor diagnosis at the N.N. Blokhin Russian Oncological Research Center of the Russian Academy of Medical Sciences. In 2007, he was appointed head of the endoscopy and endosurgery group at the N.N. Blokhin Russian Oncological Research Center RAMS. From 2011 to 2016, he served as head of the department of general surgery at the Central Clinical Hospital of the Russian Academy of Sciences. He has personally performed more than 1,000 videotaped operations: lung resections, lobectomies, partial hepatectomies, nephrectomies, adrenalectomies, removal of retroperitoneal and mediastinal tumors, and stomach resections. He is well versed in all types of laparoscopic procedures on the colon and also in all types of diagnostic biopsies (on the peripheral lymph nodes, liver, lungs, mediastinum, retroperitoneal lymph nodes, bones, kidneys, and more, including those under CT and ultrasound guidance). He is a lecturer at the Educational Center of Medical Technologies in Kazan.